Request a quote for a bulk order for TBP monoclonal antibody - Classic. Please fill out the form here below. Your local sales account manager will get in touch with you shortly and send you a quotation based on your requirements. Monoclonal antibody raised in mouse against the amino-terminal domain of human TBP (TATA box binding protein). 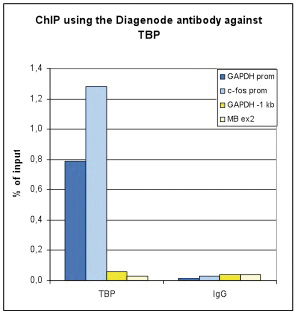 ChIP was performed with 5 μg of the Diagenode antibody against TBP (Cat. No. C15200002) on sheared chromatin from 1 million HeLaS3 cells using the “Auto Histone ChIP-seq” kit (Cat. No. C01010022) on the IP-Star automated system. The IP’d DNA was analysed by QPCR with optimized PCR primer pairs for the promoters of the active GAPDH and c-fos genes, used as positive control targets, and for a region 1 kb upstream of the GAPDH promoter and the coding region of the inactive MB gene, used as negative control targets (figure 2A). The IP’d DNA was subsequently analysed with an Illumina Genome Analyzer. Library preparation, cluster generation and sequencing were performed according to the manufacturer’s instructions. The 36 bp tags were aligned to the human genome using the ELAND algorithm. Figure 2 shows the peak distribution in 50 kb regions surrounding the GAPDH, c-fos, ACTB and MCL1 genes (figure 2B, C, D and E, respectively). These results clearly show a localisation of TBP at the promoters of actively transcribed genes. ChIP assays were performed using U2OS cells, the Diagenode antibody directed against TBP (Cat. No. C15200002) and optimized primer sets for qPCR. Sheared chromatin from 1x10e6 cells and 4 μg of antibody were used per ChIP experiment. QPCR was performed with primers for the promoter of the c-fos and GAPDH genes (Cat. No. C17011004 and C17011001), a region 0.5 and 1 kb upstream of the GAPDH promoter (Cat. No. C17011002 and C17011003), respectively, and for exon 2 of the myoglobin gene (cat. No. C17011006) as a negative control. Figure 1 shows the recovery (the relative amount of immunoprecipitated DNA compared to input DNA) and the occupancy (ratio +/- control target). 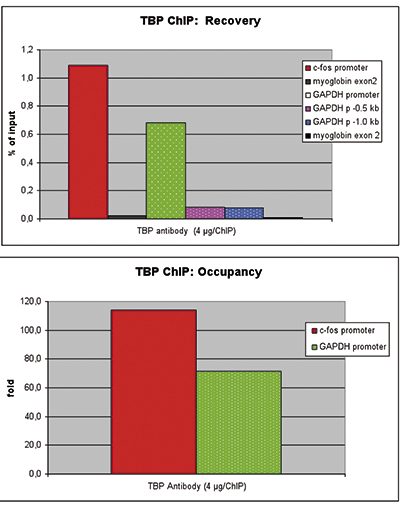 These results demonstrate the occupancy of both promoters by TBP. 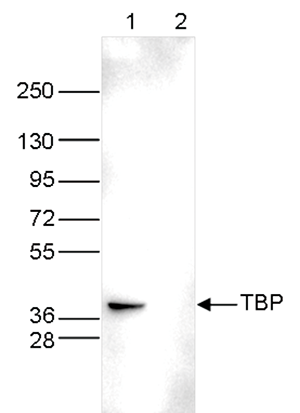 Whole cell extracts (40 μg) from HeLa cells transfected with TBP siRNA (lane 2) and from an untransfected control (lane 1) were analysed by Western blot using the Diagenode antibody against TBP (Cat. No. C15200002) diluted 1:500 in TBSTween containing 5% skimmed milk. The position of the protein of interest is indicated on the right; the marker (in kDa) is shown on the left. Diagenode strongly recommends using this:	TBP monoclonal antibody - Classic (Diagenode Cat# C15200002 Lot# DA-0010 ). Click here to copy to clipboard. Adenovirus E1A Activation Domain Regulates H3 Acetylation Affecting Varied Steps in Transcription at Different Viral Promoters. A pro-apoptotic function of iASPP by stabilizing p300 and CBP through inhibition of BRMS1 E3 ubiquitin ligase activity. The unfolded protein response and the phosphorylations of activating transcription factor 2 in the trans-activation of il23a promoter produced by β-glucans. Recruitment of histone deacetylase 3 to the interferon-a gene promoters attenuates interferon expression. Transcription initiation platforms and GTF recruitment at tissue-specific enhancers and promoters. Role of p53 serine 46 in p53 target gene regulation. TIPT2 and geminin interact with basal transcription factors to synergize in transcriptional regulation. Denissov S, van Driel M, Voit R, Hekkelman M, Hulsen T, Hernandez N, Grummt I, Wehrens R, Stunnenberg H.